List of Genuine Online Typing Jobs providing sites and ideas. 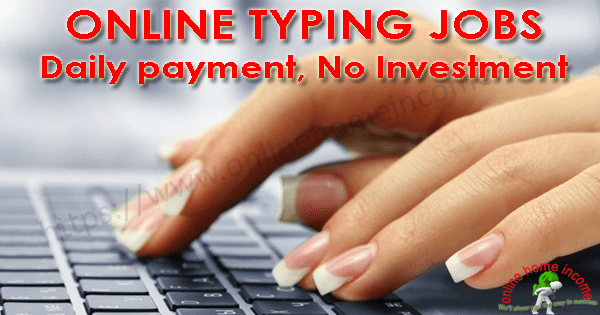 Hi Readers, today I am going to discuss Online Typing Jobs – one of the easiest ways of earning money online. Because you are going to put your fingers to work and earn money for each word you type on your computer. Almost everyone is having access to the Internet today were searching for online jobs without investment. Though there are so many jobs are available on the Internet, people are still looking for no investment jobs. To those, I suggest online typing jobs without investment which is the best go-to place to find a genuine work at home jobs. This job is suitable for many people especially college students and housewives were showing more interest in these jobs. As this job requires no any great skills and knowledge, one can easily make handsome income every month. It is difficult to find genuine typing jobs as there is a lot of scam/fraud involved in it. Really the genuine online typing jobs do not require you to invest any money or registration fee. In this article, I am going to share you the ideas of how to find the genuine one? Also, I have listed some genuine sites to start working. This work is basically a simple job similar to online data entry jobs, which include typing on the computer. You can start doing this job from the comfort of your home and get paid to your bank account directly. There are many different kinds of typing jobs are available and even data entry jobs, form filling jobs all come under this category. Hence this tells us that there is always a huge demand for this job across the internet. If you have good typing speed, say about 35 words per minute, you are then ready to make a great monthly income. A common question from my readers on any new job post I publish on my blog. Hence I deemed the responsibility to answer here too. One can earn a decent income by doing online typing jobs from home as it depends on your own performance. It is therefore possible to make Rs. 30000 and more every month if you do it right. In this article, I have explained different jobs based on their competition and the earning potential. So, once you through the article completely, you can calculate the average income you can able to earn from this job. On an average, it is possible to earn around Rs.500 to Rs.1000 per day by working from home. Payment processor account such as PayPal. If you work directly for a company or an employer, you can get your payment credited to your bank account directly. Else, some websites such as freelancer, upwork will pay their freelancer’s through PayPal and it will be automatically transferred to your local bank account. It is possible to earn a decent income from this job, but however, there are some disadvantages which you should aware of. Not every online job is suitable for everyone because considering certain circumstances, some jobs become unsuitable. Let us see the various advantages and disadvantages now. I have mentioned only a few cons here, but however, there is a huge opportunity to make a decent income every month. Let us see the different typing jobs and the list of sites that provide genuine jobs for the people. This article consists of list of sites that offer genuine typing work from home. Since the Internet is having both good and bad, it is our responsibility to find only the genuine sources of making money. There are many freelancer websites available on the Internet that offer genuine online typing jobs without investment from home. This is the first place I recommend everyone to join because there is no way of getting scammed here. These sites are very popular in serving different kinds of online jobs and are 100% genuine. You need to register a free account as a worker before finding or getting a job to work from home. I have already written an article about the registration process in Freelancer Website which may be useful for you now. 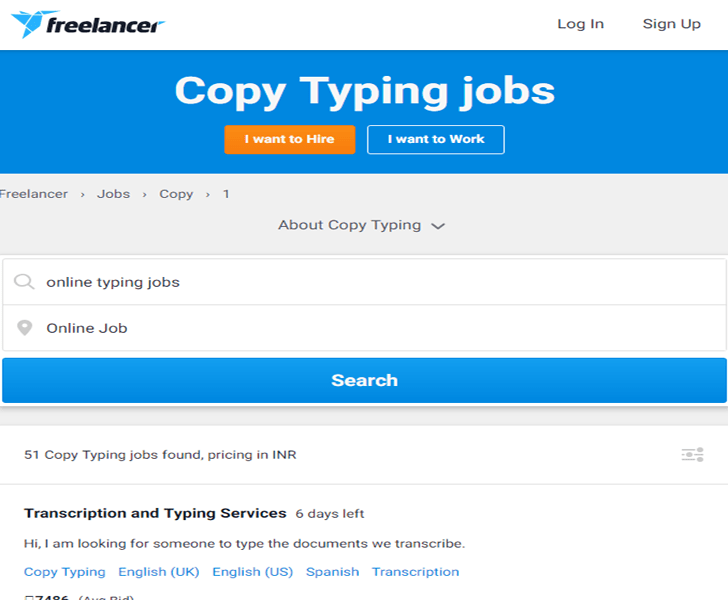 Since Freelancer is offering so many other different kinds of jobs, however, you can easily find one suitable online typing jobs to work at home. Then browse for the title – “typing jobs” from the list of categories. You will find plenty of jobs for different employers. Now you should read their requirements and terms of conditions, and then hit the Bid Now button if you are willing to work. Quote your offer, estimated time to complete the project, and other necessary details if required by the employer. PS: Many people will be bidding for the same job, and this creates a competition in getting the job. Many experts and even experienced people to apply for the same job and since you are a beginner, chances are too few to get the job. Hence I recommend you to quote a very small amount than the average bid to get the job easily. Once your reputation starts growing, you will more similar online typing jobs in the future. After placing the bid, you will be informed via email if you are hired. Complete the work on time to earn money and a good reputation. The process is very similar to UpWork but the user interface is quite different but once you understood the process, it will be much easier. Working on more than one site will increase the chances of getting more jobs from home. So don’t wait anymore, go to the recommended sites and register an account. Complete your profile and search for the jobs. Bid on the project, take the job, complete on time, and submit to the employer to get the payment. Both of these websites will make your payment via payment processor such as PayPal and hence it is necessary to have one account. This is a bit different from the other kind of typing jobs because here you will have to put your brain to work along with fingers. Here, you will be given a title or a context where you have to write about the topic in your own way. There is a huge demand for content writers because of the digitalization many blogs, websites, online magazines, press journals require more new creative writers. Since fresh content is the core that keeps their business alive, there is always a need for writers. There are so many different kinds of writing jobs available such as creative writing, copywriting, and narrative writing etc. As a beginner, you will earn approximately 10p to 30p per word you type to complete the content. Once you gained experience and knowledge, you can earn more money per word you type. Do not think where to find the content writing jobs, just visit the link here and get the list of sites to start working immediately. Even, Online Home Income require creative content writer’s for our online business and deserved candidates can apply today. This is another great online portal to find the genuine online typing jobs without investment. Online Micro Jobs are defined as, “a small job/task that is usually available for a small project and for a short time”. Many companies and employers outsource their office work to these micro jobs websites. This creates a huge employment for many people to work at their home and get paid genuinely. You can find simple typing jobs, writing jobs, online surveys, and other similar kinds of jobs here. These jobs do not require any special skills and you will be paid between $0.05 to $1 for every job you complete. Also, each task won’t consume much time and you can work any time as you wish. If you like typing works, then I recommend you to start a blog to earn money by using your typing skill. 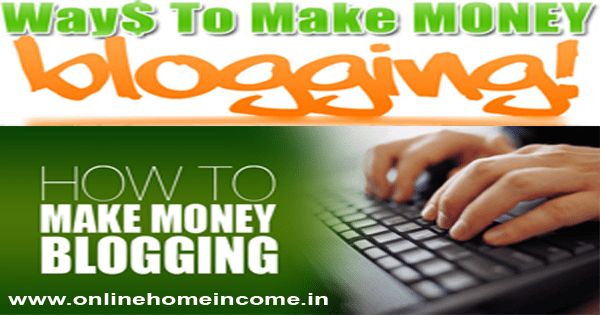 Blogging is the most efficient way of making money from home and it creates a sustainable income over years. You should update your blog content with fresh contents on what your users need? Thus it requires a lot of typing because you should keep writing more new articles on different topics. You cannot make money overnight in this typing job because your blog needs traffic to start generating revenue. Along with the typing skill, you need a good SEO knowledge including both On-Page and Off-Page SEO with patience. Do not get stuck on what topic to choose to start a blog, learn lots of ideas from this article – Different blog ideas to start blogging. Blogging is a tedious process and if you do with patience and perseverance, surely you will achieve success. If you wish to start a blog and earn more than a lakh every month, ask me how? Almost all online jobs are genuine but there are equal scam jobs are also there that traps people and make them lose their money. The above sites I have recommended and the ideas I have shared are 100% true and genuine. There is no absolute way of getting scammed by anyone. However, there are few chances out there where people were easily scammed. Let us see what are the different techniques used to scam people. Do not pay any fee: If the site is asking any kind of investment or fee, then just stay away from them. Because the real employer or the company needs the employee to complete their data typing work and why there is a need to ask for a fee? A small common sense will save you from being scammed. The legitimate source such as freelancer and upwork never ask their members for a fee. Company History: Do not join a new company or website? Even the website or the company that claims many years of industry experience seems to be a scam. Ask them for the real registration proofs of the said year before joining them. Fake Testimonials: Most websites do have a separate testimonials page to trap new visitors very easily. In fact, most of these testimonials are fake and photos were taken anywhere from the Internet. Try to find the authenticate the source of the testimonials before trusting them. Location: Do not join companies that are located far away from your home location. This is an utter proof of the scam. Also, some website display some random address on their contact page, try to verify the real location before joining. Read User Reviews: Normally, every website that provides typing jobs do have a legal name for their business. Try to verify their authenticity of the business name and their real location. Find the administrator: This is the very common method of scamming people by not revealing their identity. If the site does not reveal the real person behind the screen, then it’s 100% sure they are a scam. Check Whois Data: This is a very easy method of identifying scammers online. Go to https://www.whois.com/whois/ and type the domain name. Look at the results which shows the registrant name, address, phone number and email ID. If those data’s are protected, probably it is a sign of a scam. Be aware of and analyze more before joining them. There are so many different types of methods do the scammers are following to trap people easily. So, next time before searching for online typing jobs, keep all these important advice in your mind. To sum up, I recommend this job is genuine and it depends on the website or the company that offers this job. If you are the one among the people who search for easy online jobs from home, then you should believe there is nothing you will get easier. As the internet grows, more people were getting into this field, thus constantly increases the competition on every work. You will get success if you are ready to LEARN and develop your SKILL unless you can’t tolerate the tough competition. 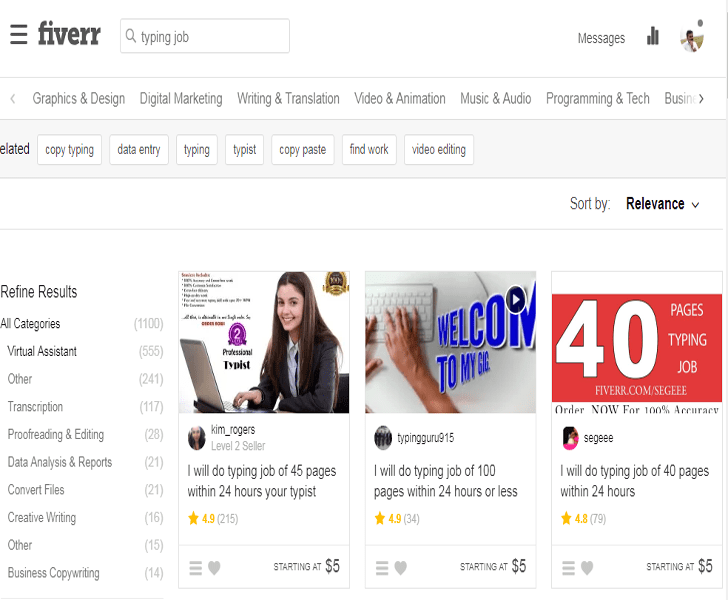 I have discovered various online typing jobs based on their income potential and competition. For an example, if you choose micro-typing jobs, then there will be small competition simultaneously the earnings will be low. Similarly, if you choose to start content writing jobs or blogging, then you can earn more money every month. Online Typing Jobs are very easy to work if you have good typing speed and good command of English. I hope this article is useful to you. Kindly share this article with your friends on Facebook and Twitter. This will help someone who is searching for genuine jobs from the Internet.